Customer Journey Analytics is one of the most trending buzz words in the world of performance marketing and marketing analytics space. It's being presented as the holy-grail of marketing ROI that's supposed to bring clarity into the complicated journey of discovery to advocacy in the customer lifecycle, and eventually help businesses in improving their marketing ROI. But is that really the case? How far are we from the reality? We are way too far and many things are wrong. Let's discuss the top three. Almost all customer journey analytics tools today focus on an approach that can be better compared to forensics. And all approaches assume that you'll have lot of (hopefully) clean data to begin with. Analyzing massive amount of data brings in altogether new set of challenges. So then most solutions start focusing on using some sort of (yet another big buzz word called) machine learning algorithm to forensically mine and make sense of that huge pile of data. This approach has some major flaws. First off, it depends on lot of data to be able to produce any meaningful insight. Secondly, it cannot provide pin-pointed accuracy at a customer level; rather it provides an overall picture of what may be going on with some probability. This of course is sub-optimal when you could do a whole lot better. Lastly, the accuracy of its analysis depends on how clean the data is to begin with; and unfortunately most of the data out there today is unstructured, disjoint and erroneous. All this makes the forensics effort long, complicated and expensive, which further dilutes the justification for customer journey analytics. Wizardry has always been associated with marketing; considering marketing more of an art and less of a science. And the same idea has manifested through almost every tool or technology that has come out of marketing departments. Think from simple automated email marketing tools to the most sophisticated CRM tools out there, and all of them boast to have some sort of wizardry built into them that would magically solve all your problems. 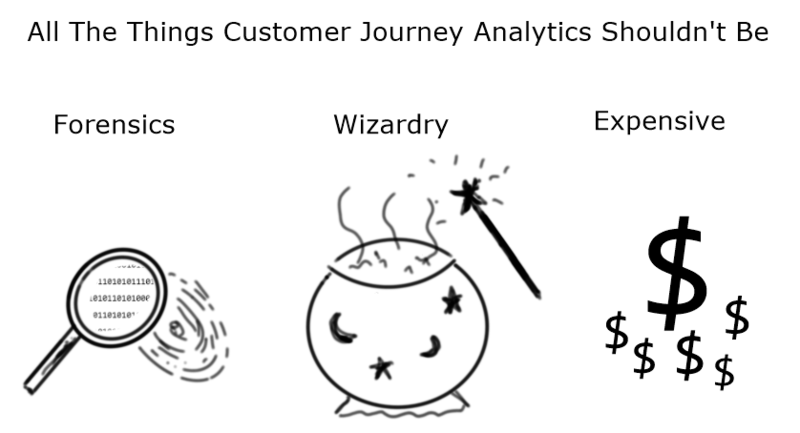 And without surprise, the same is happening to anything associated with field of customer journey analytics. Very few to almost no standard techniques exist around capturing, storing and analyzing user behavior across various channels. As a result today the approach to customer journey analytics is based more on working with industry experts from their respective fields and less on just letting the data tell the story. Last but not the least, just like it happens with every new marketing buzz word, tools associated with customer journey analytics are typically over hyped and over-priced. They claim to magically tell you what you didn't know about your business and solve all your problems. But we all know that's far from truth. What's really true about customer journey analytics is that it's just a better way of understanding how your customers engage with you and an effective way to improve those engagements. And it is easily solvable if customer journey analytics is made part of your marketing technology stack ground up. It doesn't have to be an expensive forensic activity or a wizardry or an afterthought.